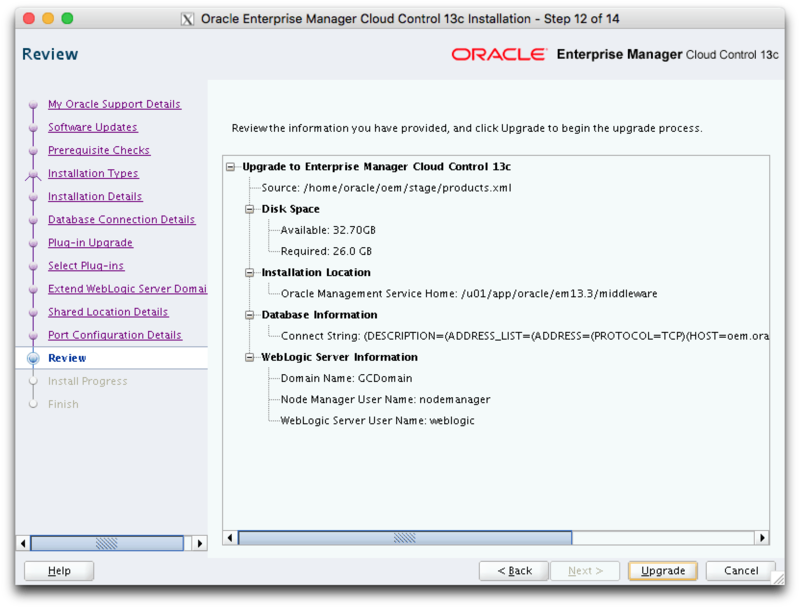 Oracle launch a new version for Oracle Enterprise Manager a few weeks ago: 13cR3. 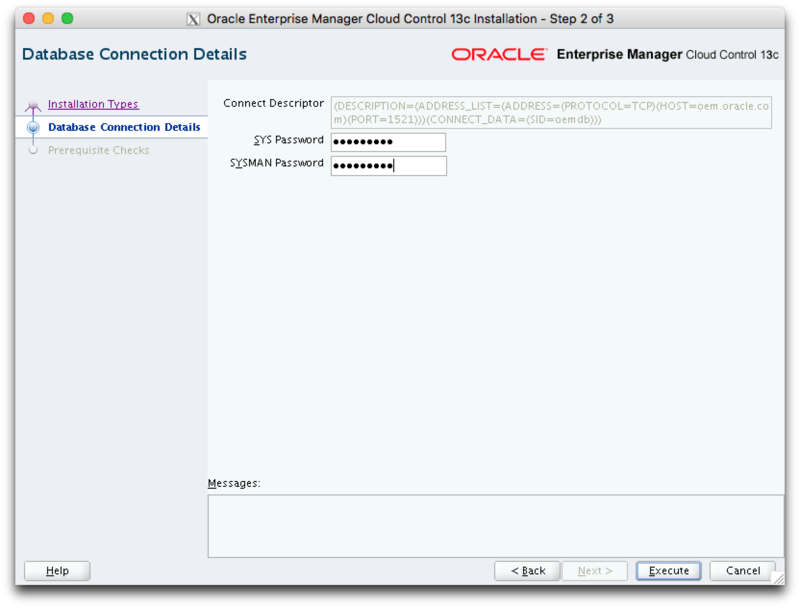 In this blog post we’ll se how to upgrade to EM13cR3 from EM13cR2. 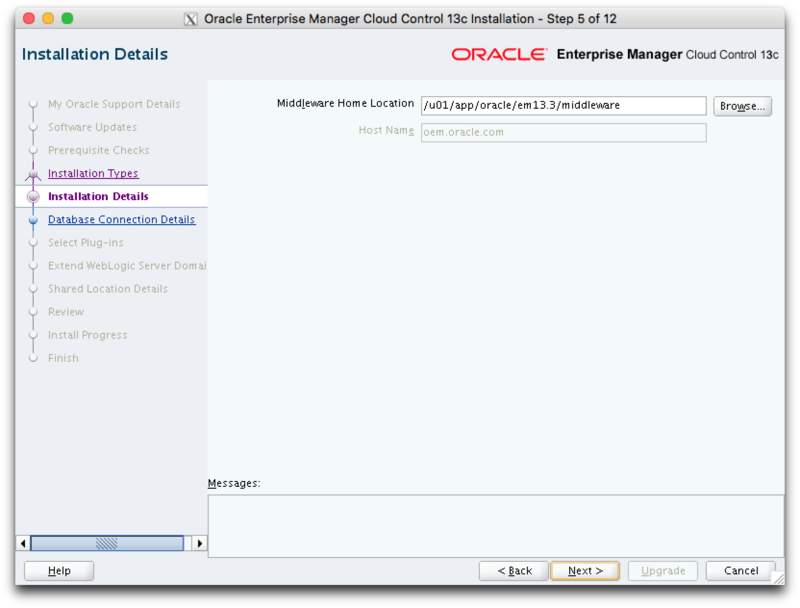 This virtual environment have just one virtual machine, the VM is called OEM. Well, we are considering that we already have an OEM 13cR2 environment installed. So, in this post we’ll check the steps to upgrade EM13cR2 to EM13cR3. 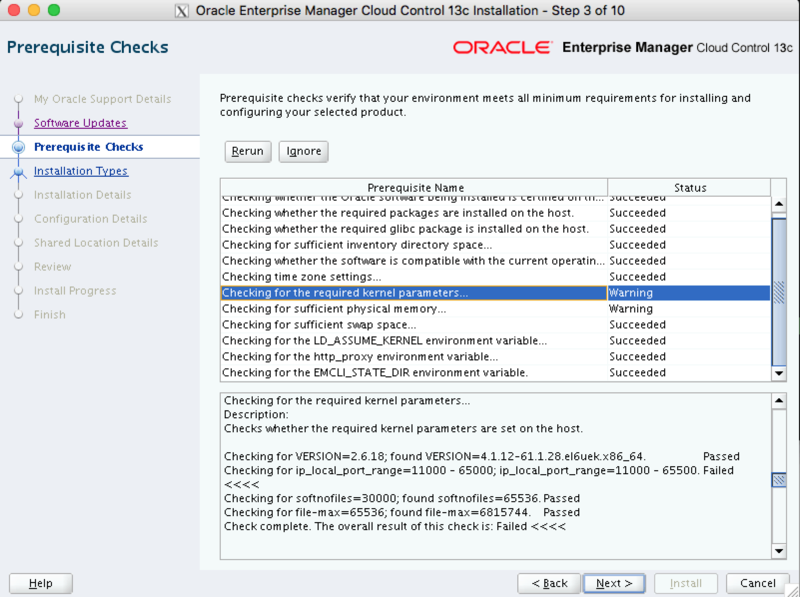 So, in this post I won’t show how to install and configure an OEM environment. Make sure that you’ve downloaded all the files and transfer all of them to the server. Use some software that uses SCP protocolo, for example. You need to ensure that all the pre-reqs are OK before continue to upgrade. 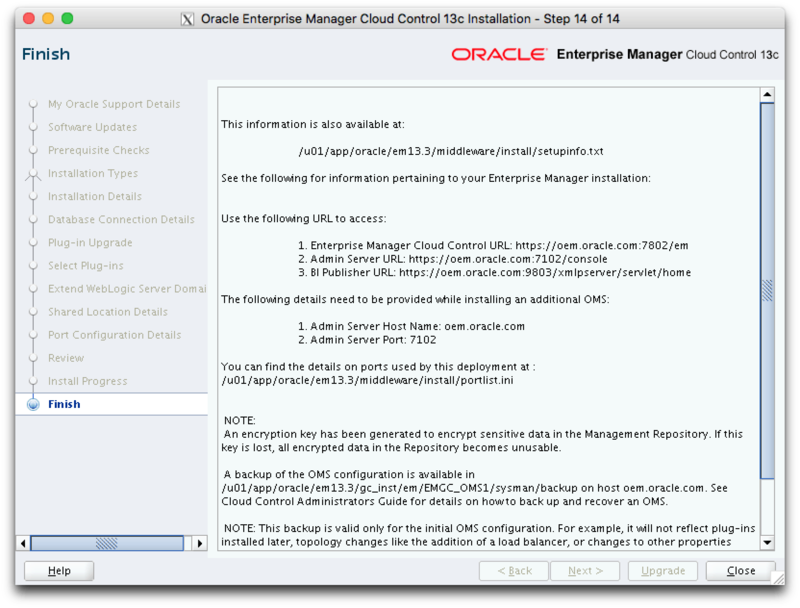 In the documentation Enterprise Manager Cloud Control Basic Installation Guide (click here), we can check it. 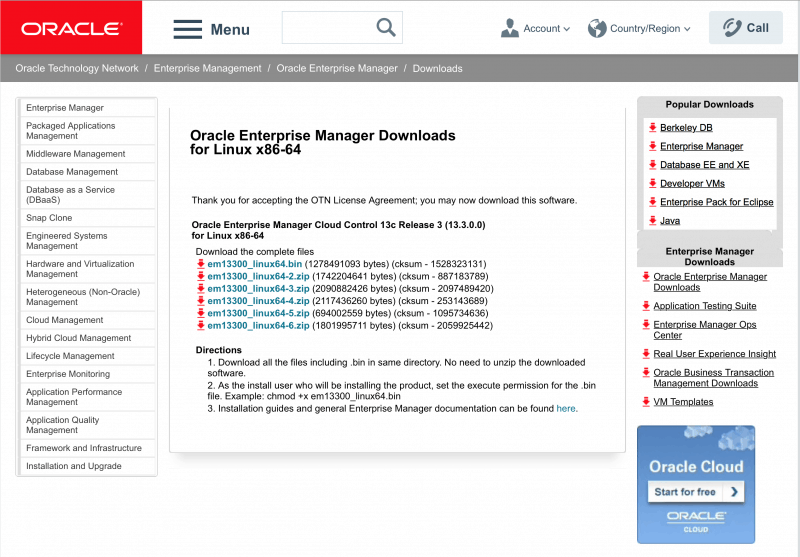 2.2.1 Kernel Parameter Requirements for Oracle Management Service – (click here) – even in 64-bit installations we need to install 32-bit packages. Do not forget to check all the pre-reqs, for example: users, groups, etc. Is supposed to all the pre-reqs to be ok, since we already have an installed environment. 3.1 Hardware, Software, and Platform Requirements – we already talked about this document few lines above. 3.3 Database Patch Requirements – Is mandatory that we are running database with the latest PSU applied. This blog post won’t show how to do this. 3.4 Optimizer Adaptive Feature Disabling Requirements – parameter optimizer_adaptive_features needs to be defined to FALSE. 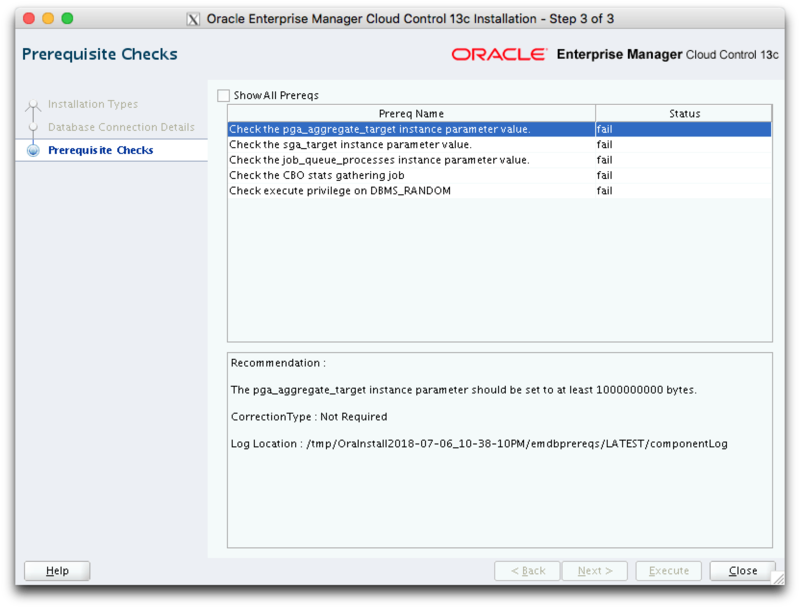 3.5 Database Initialization Parameter in Oracle Database 12.2.0.1.0/18.0.0.0.0 – If repository is running in those versions, you need to set parameter _allow_insert_with_update_check to TRUE. 3.6 Management Agent Patch Requirements – If you still have some agent running in version 12.1.0.4 on AIX you will need to apply patch 20282974 before upgrade OMS. 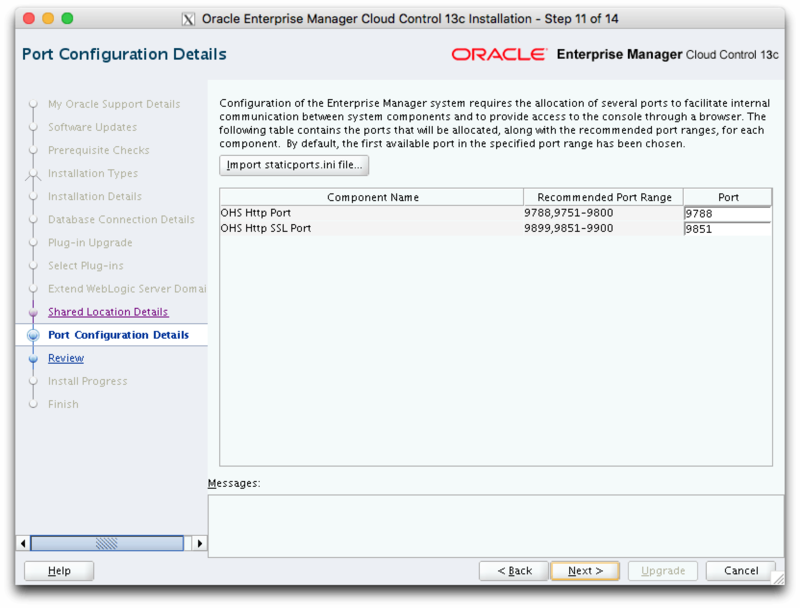 3.7 Port Requirements – If the actual OMS installation use some port below port 1024, the Upgrade will fail. 3.8 Customization Removal Requirements – If you have some datasource with customized parameters in Weblogic, remove them and use the default parameters while you are doing upgrade. If you use smart card authentication, remove this configuration as well. Both configurations can be recreated after upgrade. 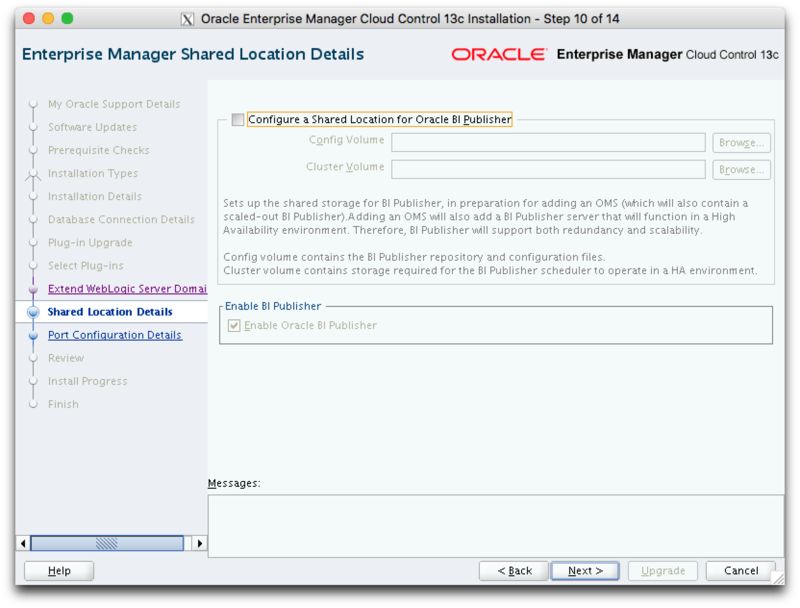 3.9 Oracle BI Publisher Shutdown Requirements – Ensure that BI Publisher is down. 3.10 Database Service Instance Creation Request Verification Requirements – If you was creating a Database Cloud Service, wait this operation finishes. 3.11 Repository Table Snapshot Verification Requirements – Ensure that you don’t have any materialized view log (snapshot logs) in EM’s owner repository tables. Usually is SYSMAN. emcli update_audit_settings -operations_to_enable="DELETE_TARGET" -audit_switch="ENABLE" -file_prefix="aud"
3.14 Selectively Skipping Some Job Type Updates for Reduced Downtime of Your Enterprise Manager System – While the upgrade is doing, some types of jobs are registered. As part of the register of this job, all active executions will be automatically updated to this new type of job registered. We can skip this step so we’ll reduce downtime while Upgrade is doing. So, if we skip, this jobs will be updated after OEM upgrade and with OEM up and running, without downtime. The EMKey is configured properly, but is not secure. 3.16 Certificate Key Strength Requirements – You need to ensure that certificate used by EM should match at least 1024 bits. If you is using a certificate with lower security level (for example: in EM 11gR1), you need to create a new one with at least 1024 bits. You can follow the instructions at Metalink’s Note (MOS – My Oracle Support) to fix this issue: 1611578.1. 3.17 Out-of-Box Memory Settings Backup Requirements – If you have changed the default values for JVM memory, you need to save this values for reference to not lose the during Upgrade process. 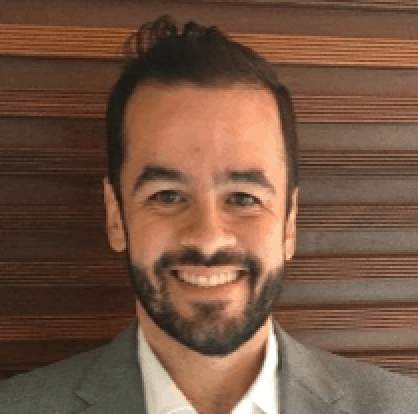 3.18 Prerequisite Check and Environment Validation Requirements – You need to execute EM Prerequisit Kit to check if all pre-reqs are OK to start Upgrade. Launcher log file is /tmp/OraInstall2018-07-06_10-38-10PM/launcher2018-07-06_10-38-10PM.log. 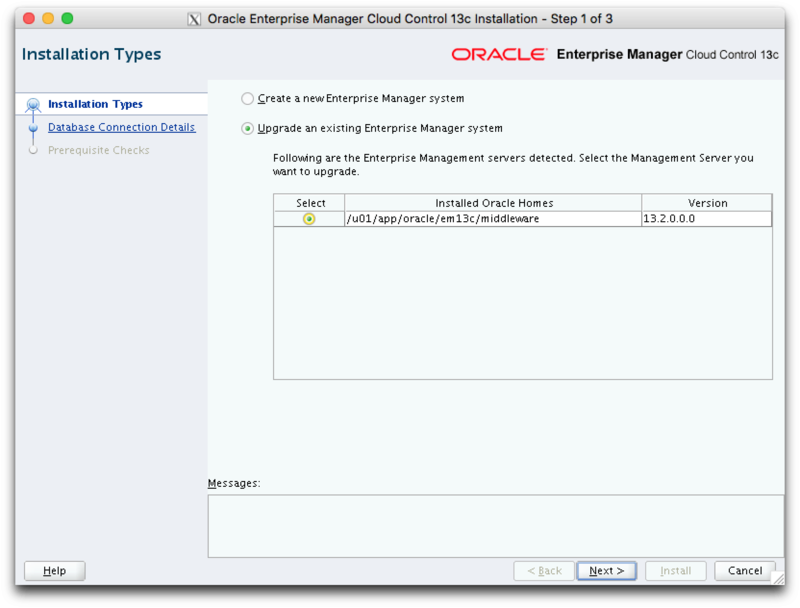 Click on “Upgrade an Existing Enteprise Manager System” and then select the actual installation. Then click on [Next]. Input SYS and SYSMAN passwords for the database used as repository and then click on [Execute]. The pga_aggregate_target instance parameter should be set to at least 1000000000 bytes. The sga_target instance parameter should be set to at least 3000000000 bytes. 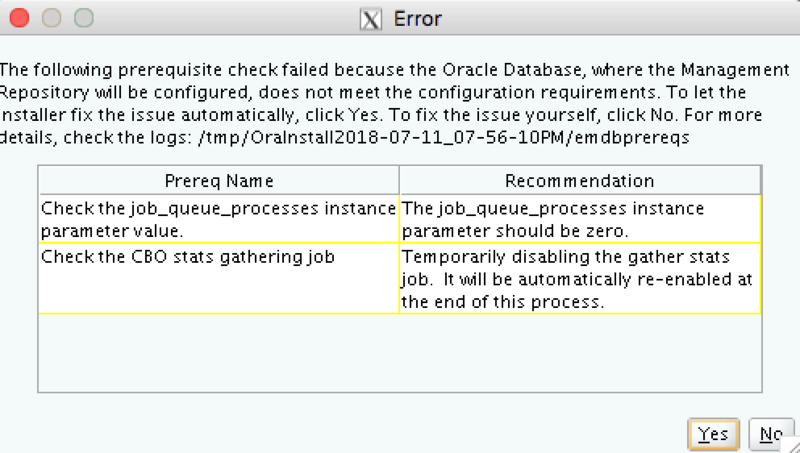 The job_queue_processes instance parameter should be zero. Temporarily disabling the gather stats job. It will be automatically re-enabled at the end of this process. Not Required – It is a warning message and you can ignore it and move ahead. Manual – It is an error message and you must manually fix it before moving ahead. Auto – It is an error message and you can ignore it since EM has predefined corrective actions to fix it. 3.22 Management Agent Proxy Removal Requirements – If you have some proxy defined for some agents, remove them. If you not remove, the agent’s upgrade will fail. 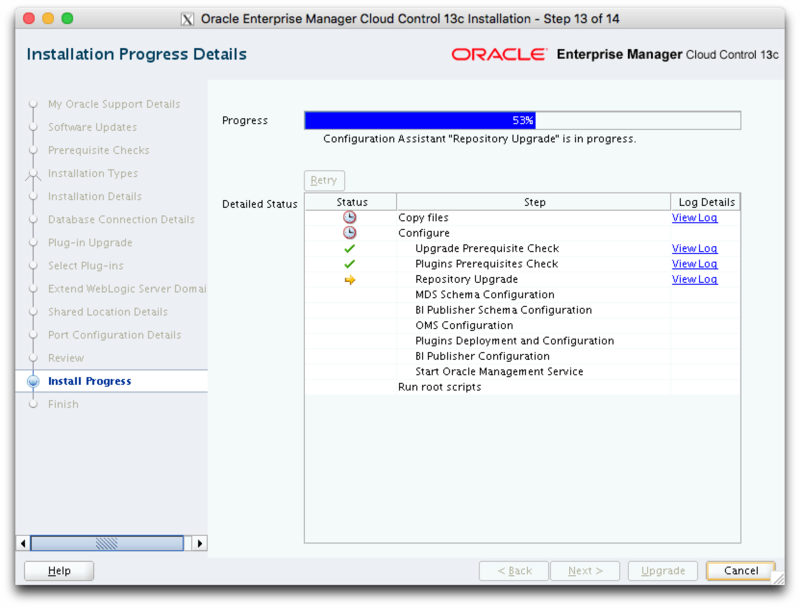 3.23 Additional Preparation and Steps Required for Performing an Upgrade and Transition to DR Readiness – This step is useful only you have DR configured for EM. Oracle Ops Center Infrastructure stack (oracle.em.sooc). Now you already did a check on pre-reqs, you can start the upgrade process. Launcher log file is /tmp/OraInstall2018-07-07_12-26-02AM/launcher2018-07-07_12-26-02AM.log. 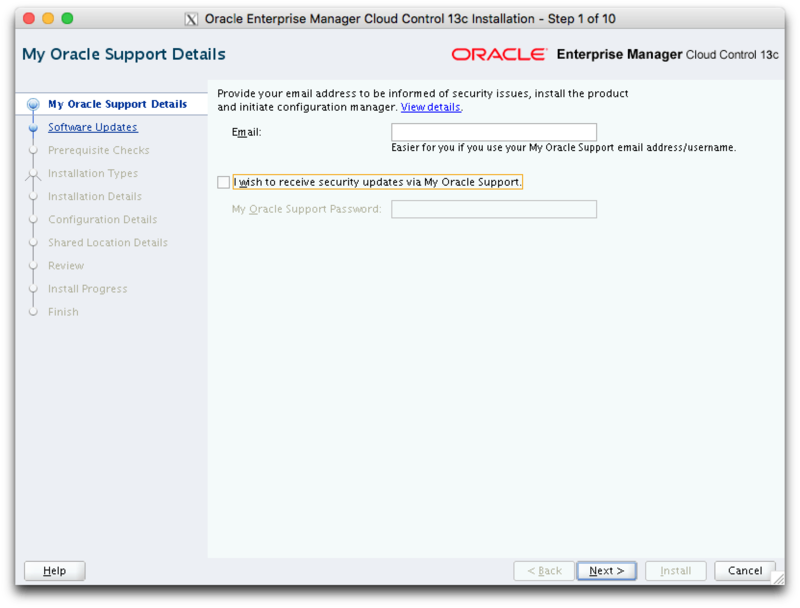 If you choose to not configure this, uncheck the option [I wish to receive security updates via My Oracle Support] and then click on [Next] button. You should receive a warning, click on [Yes] button. There is a pre-req failure for the kernel parameter kernel ip_local_port_range. This can be ignored since the value expected is the same to the value configured. Click on [Next]. You are not able to continue without a backup (or to take OUI aware that you have one :-)) . Click on [Confirm that you have backed up the Management Repository] option. Deferred Data Migration is a post-upgrade activity to migrate the format of the data stored in an earlier release of Enterprise Manager to the format compatible with the upgraded Enterprise Manager system. 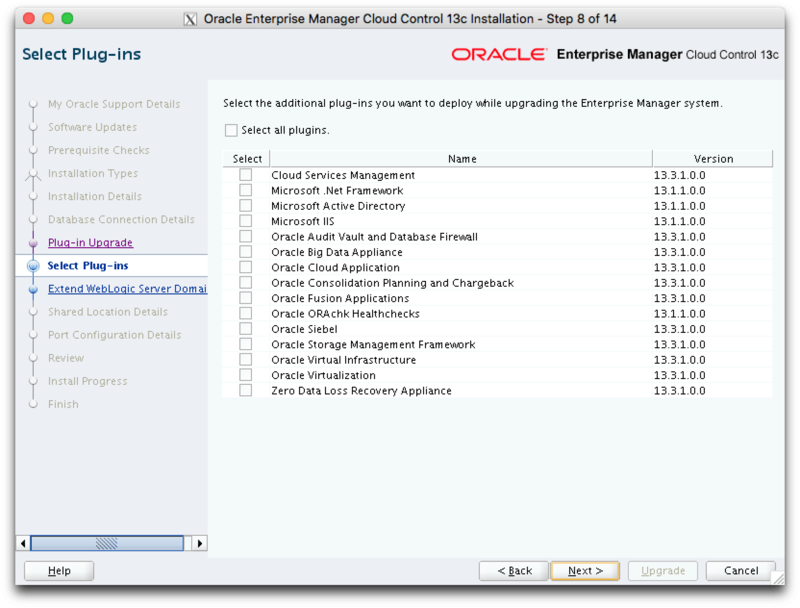 The migration activity is essentially a job in Enterprise Manager that is submitted when the Oracle Management Repository gets upgraded and is scheduled to run in the background when the upgraded Enterprise Manager system starts functioning. 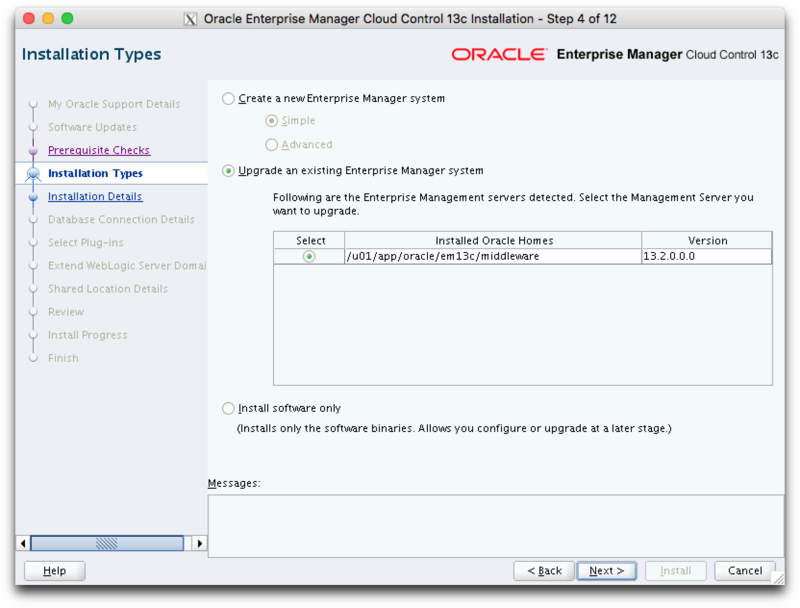 The format of the data stored in Enterprise Manager Cloud Control is different from the format in which the data was stored in any earlier release of Enterprise Manager. 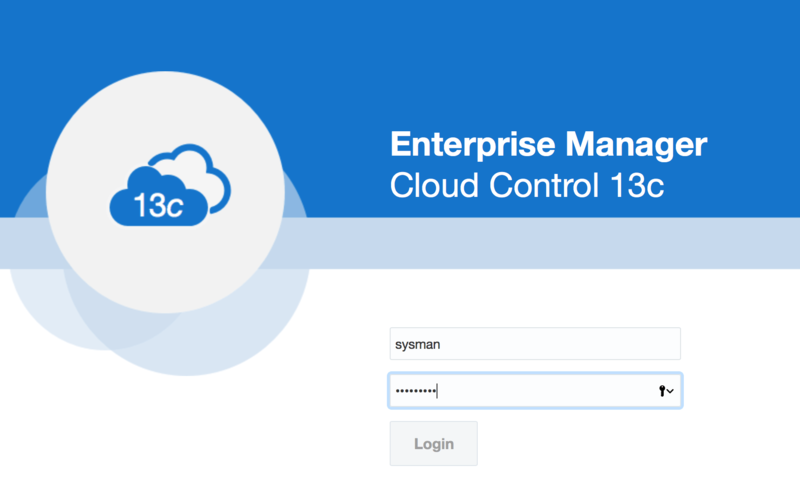 When you upgrade from an earlier release of Enterprise Manager to Enterprise Manager Cloud Control, the data format gets automatically converted or migrated to the format that is compatible with Enterprise Manager Cloud ontrol. However, the time taken to migrate the data format depends on the volume of data available in your earlier release of Enterprise Manager. Therefore, if you have a large amount of data, then it takes longer to migrate, and as a result, the upgrade process takes more time to complete. 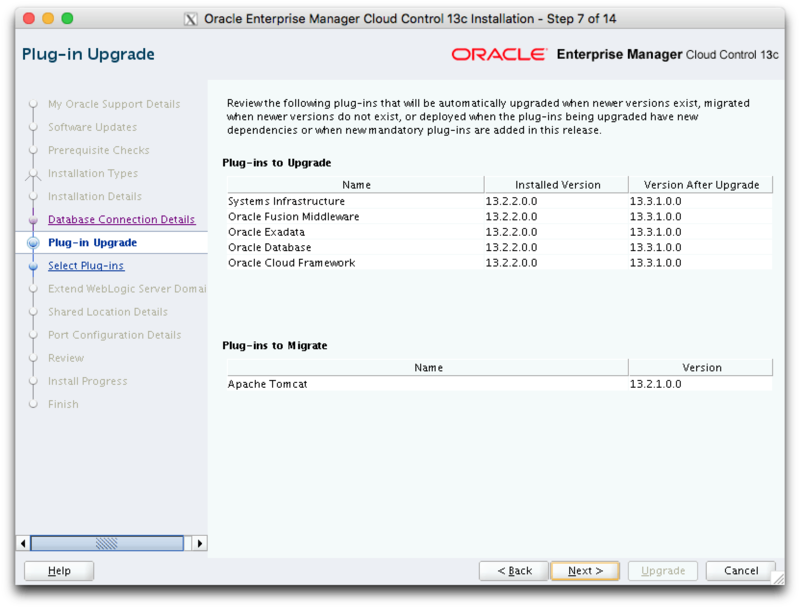 Unfortunately, until the upgrade process completes, your existing Enterprise Manager system might be unavailable, particularly when you use a 1-System upgrade approach (either on the local host or on a different, remote host). Considering this, Oracle has fine-tuned its upgrade process to migrate the data format in two distinct phases. In the first phase, when the Enterprise Manager system is shut down and upgraded, the most critical data relevant to the functioning of Enterprise Manager Cloud Control is migrated within a short time so that the new system can start functioning without much downtime. 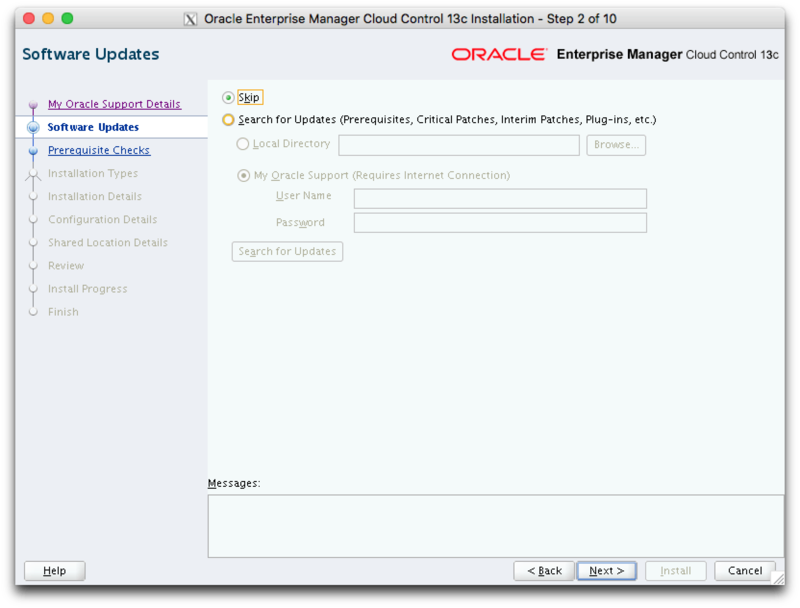 At this point, only some historical data is unavailable, but you can start monitoring the targets in the upgraded Enterprise Manager system, and see new alerts generated by the upgraded Oracle Management Agent. In the second phase, after the upgraded Enterprise Manager system starts functioning, the remaining data is migrated. The data whose format is migrated in the second phase, after Enterprise Manager Cloud Control starts functioning, is called the Deferred Data, and this process of migrating from old to new format is called the Deferred Data Migration. This warning is exhibited because you have MD5 certificates. This certificates still work because this is an Upgrade, but, is recommended that the targets use SHA-based certificates. Click on [OK] button. A information message is exhibited asking you to apply the mandatory patches in the database used as repository. You can read more about this patches in the documentation. The message tell you that if you don’t apply the patches, the repository’s upgrade will fail. 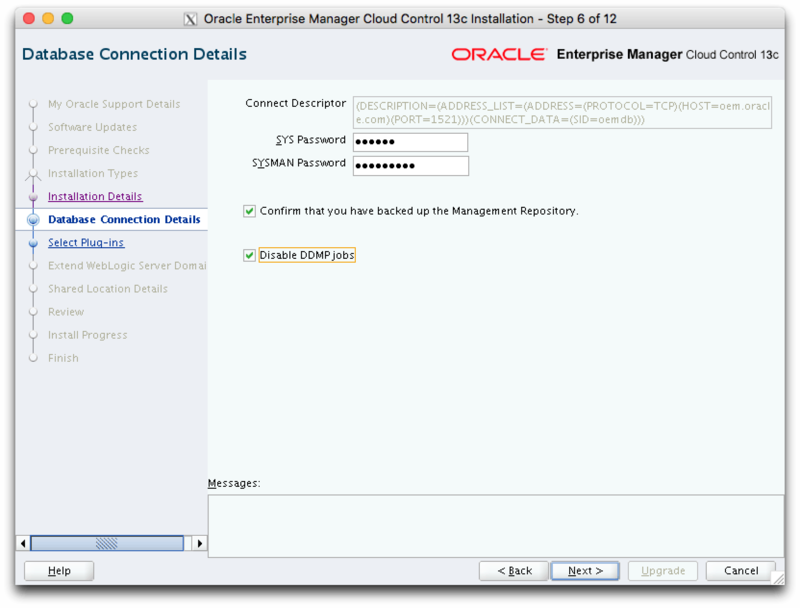 It is mandatory to apply the latest DB PSU on the supported database before upgrading to Enterprise Manager Cloud Control 13.3.0.0. So, ensure that you have the latest PSU applied on database! Uma mensagem informando que temos JVM Diagnostics Engines configurados no nosso ambiente. A mensagem pede para verificar se os Engines estão Up. Sabemos que não estão pois realizamos um Stop do OMS durante os pré-requisitos. Click on [OK] button. Another information message is exhibited because of the Agent that is running in the server is monitoring OMS and Repository. It’s recommended to stop the agent and continue with the upgrade process. Click on [OK] button. Temporarily disable CBO stats gathering job in the database. 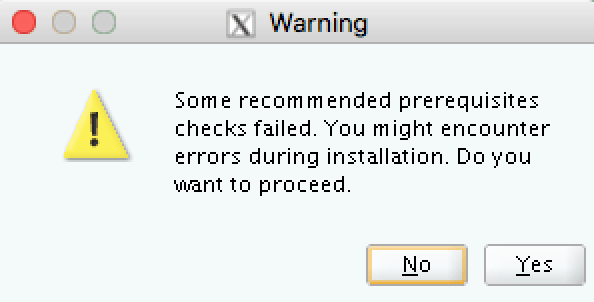 Click on [Yes] and the installer will automatically execute this tasks. After the upgrade process completed, the original values will be restored automatically by the installer. 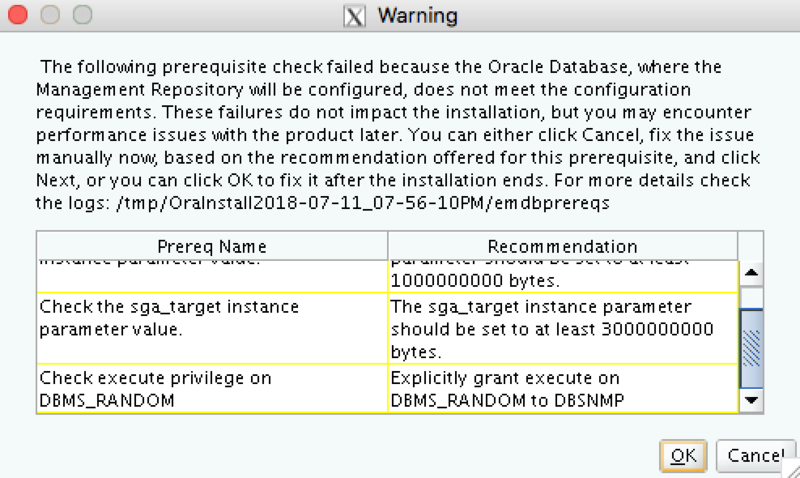 – Grant explicity execute on DBMS_RANDOM to DBSNMP. In this case, is a virtual machine environment, so, the memory components are lower than expected because I did this. We can continue. Click on [OK] buton. A list of plugins that will be upgraded will be exhibited. As you also can see a list of plugins that needs to be migrated after the upgrade. Click on [Next]. 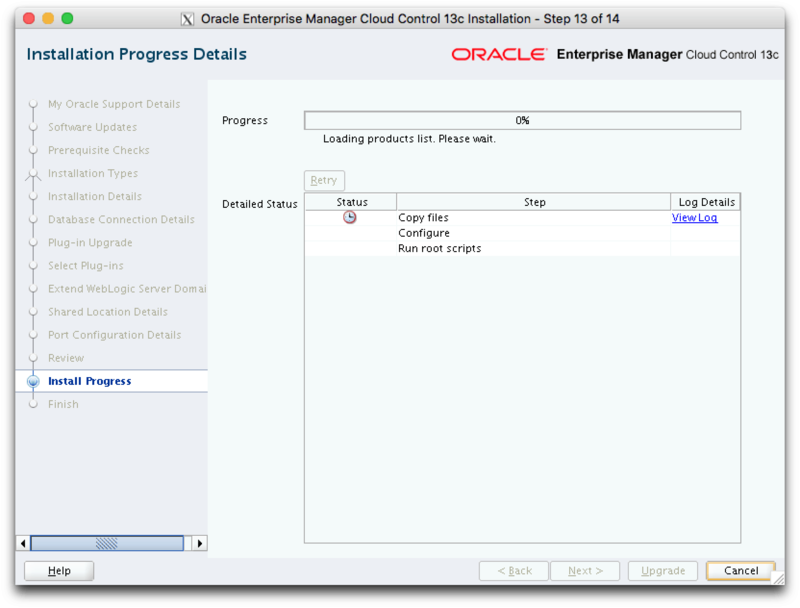 In my VM environment, Upgrade process has completed in 1 hour and 40 minutes. An encryption key has been generated to encrypt sensitive data in the Management Repository. If this key is lost, all encrypted data in the Repository becomes unusable. 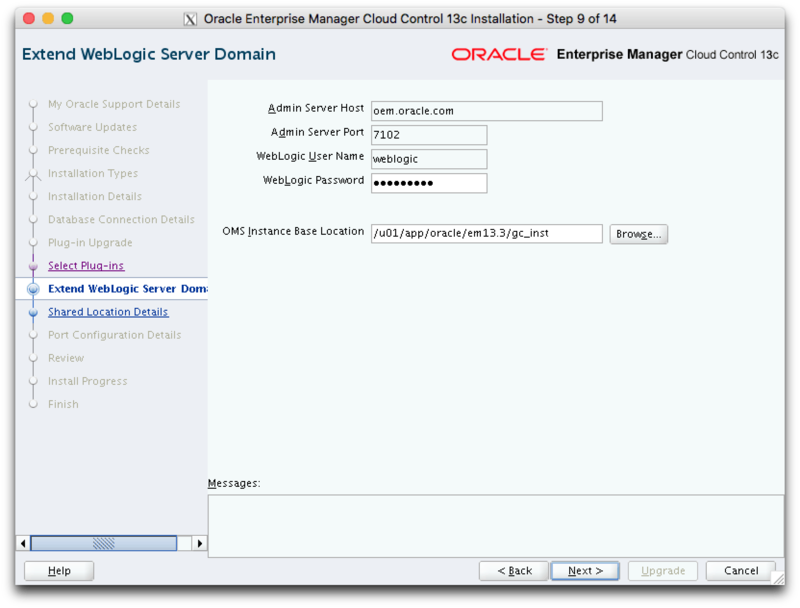 A backup of the OMS configuration is available in /u01/app/oracle/em13.3/gc_inst/em/EMGC_OMS1/sysman/backup on host oem.oracle.com. See Cloud Control Administrators Guide for details on how to back up and recover an OMS. In the next blog post we’ll execute the post-upgrade tasks and also upgrade the plugins.